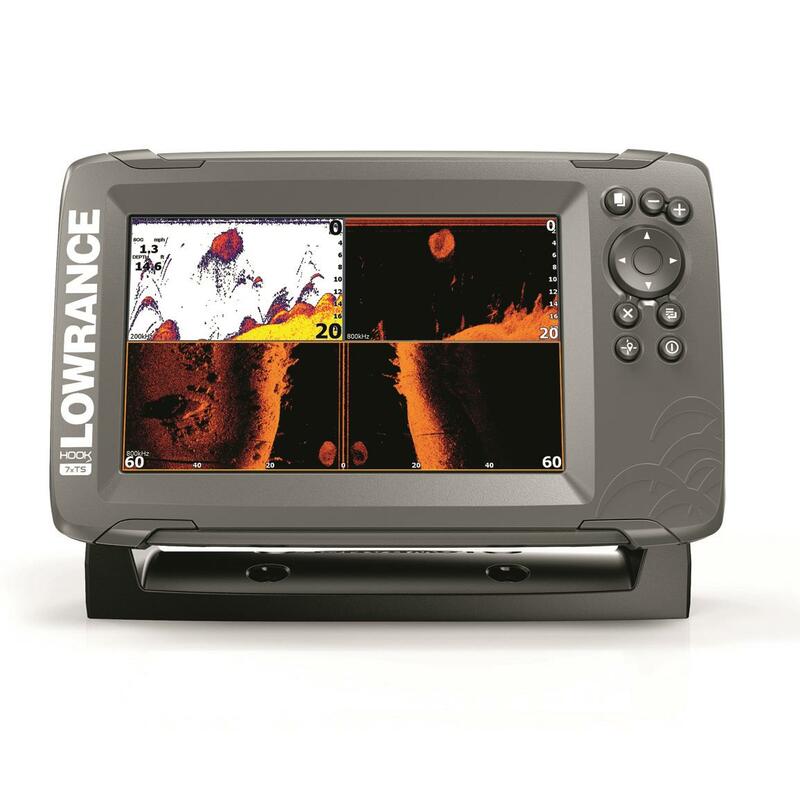 Get double the coverage and half the hassle of other fish finders with a Lowrance® HOOK2-7 Fish Finder with TripleShot Transducer. Extra wide sonar coverage returns bigger arches to see fish as well as track lures and bait as move through the water. TripleShotTM Transducer puts High CHIRP, SideScan and DownScan imagingTM returns on a 7" SolarMAX display with excellent daylight clarity and visibility. Autotuning Sonar actively adjusts settings as the conditions change to let you concentrate more on fishing. Simpler menus and easy-access key functions get this unit from the box to your boat and finding fish in minutes. 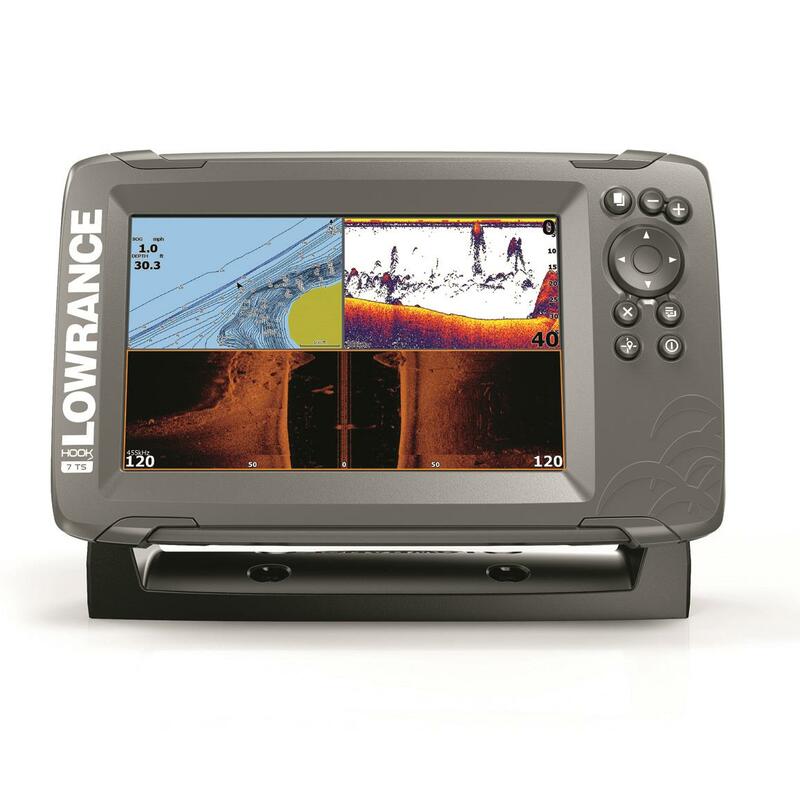 Lowrance HOOK2-7 Fish Finder with TripleShot Transducer is rated 4.6 out of 5 by 139. Rated 5 out of 5 by Fishnfool from Great product Since my old allowance finally gave up the ghost. Started researching new ones.Decided on Hook 2 7. Easy to use and priced in my range. Rated 4 out of 5 by Doctor from I’ ve Only had the unit for three months and really haven’t Been able to really put it through it’s paces yet so I can’t honestly give it a rating or review. The two times I was able to briefly use it it was easy to use and made this beginner happy. It’s going to take some time to figure what all the various options are for. As a “snowbird” I’ll be in FL. for 6months and will have time to learn what a fish finder is to do besides finding fish. Rated 5 out of 5 by bobden from Mounting Your Transducer I own a Stratos Fish and Ski with a 150 hp Johnson motor. I bought the Hook 2 to mount on my console so that I could read the depth as I was on plane running down the lake. I tried mounting the split shot transducer on 2 locations on the transom (one spot at the lowest part of the boat behind the motor and the 2nd spot further up on the side of the transom). Both locations caused me to lose the signal when I was on plane and full running. It wasn't until I mounted the transducer inside the hull that I was able to maintain a depth signal while on plane, so if this is what you desire, mount the transducer inside the hull and don't waste time trying to make it work on the transom. Rated 5 out of 5 by Mcgvr83 from Great unit for the price! This is my first experience with a fish finder, so I’m still learning but it definitely makes it easier to find spots where the fish are more likely going to be! The mapping helps a lot..especially when you stay out too late and need to find the way back to the boat ramp in the dark! Rated 3 out of 5 by Critter from Problems I have always had great luck with Lowrance units in the past. This one has never worked right. The reason being is some type of interference (electrical), from a dealer whom i assume hooked power to wrong source. Still trying to zero sort out. When trolling motor turned on screen goes black. I get great images when trolling motor is off. Have to take somewhere else. I dont trust people who installed it. Rated 5 out of 5 by dave26262626 from hook 2 7 with split shot transducer I bought this a couple of months ago and used it at least ten times. It was very easy to set up and work great so far.